Klay Thompson Breaks NBA's 3-Point Record Held By Teammate Stephen Curry Known for their 3-point shooting acumen, the Golden State Warriors' teammates collectively own the nickname "the Splash Brothers." Thompson broke Curry's record for most 3-pointers made in a game. 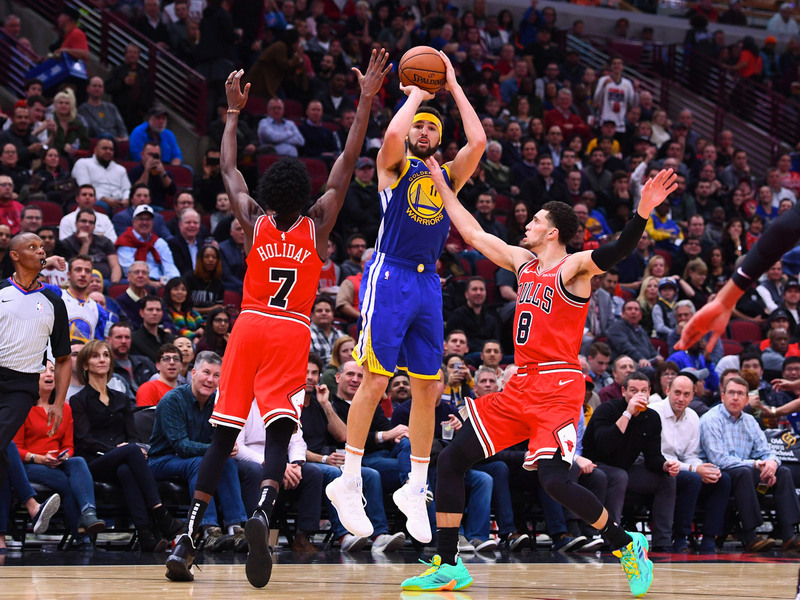 Golden State Warriors guard Klay Thompson shoots the ball against Chicago Bulls forward Justin Holiday (7) and guard Zach LaVine (8) during Monday night's game. Thompson broke the NBA's single-game record for 3-pointers. Golden State Warriors' Klay Thompson had only made five 3-point shots throughout the first seven games of the 2018 NBA season. He made 14 Monday night — in one game. With that, the 28-year-old shooting guard broke an NBA record previously held by teammate Stephen Curry for the most 3-pointers in a game and the Warriors improved to 7-1. The highlights of the performance display an in-sync and supportive team having fun, and it is actually Curry who delivers the assist to Thompson for his 13th 3-pointer, which tied the record. After scoring 10 3-pointers in the first half, Thompson received some words of encouragement from Curry. "Its funny actually 'cause you think it's like a no-hitter or a perfect game in baseball, no one wants to say anything to you. But the first thing out of Steph's mouth is, 'Go get that record bro,' and I'm like 'OK, if you insist,' " Thompson told ESPN's Scott Van Pelt. "I'm so lucky to be on a team like this." To make the feat even more impressive, the record-setter didn't even play in the fourth quarter. Thompson was taken out in the third quarter after setting the record — his team holding a commanding lead over the Chicago Bulls. He scored a total of 52 points in his 27 minutes of play in the game, which the Warriors won, 149-124. Curry wasn't the only one cheering Thompson on. Fellow Warriors' teammate Draymond Green's mother tweeted her admiration. Javale McGee, a former teammate who is known for some questionable style choices, accused Thompson of appropriating his "swag" before saying congratulations. While basketball fans on social media were no doubt impressed, it is perhaps Curry who is still the most smitten. In a video taken in the locker room after the game and posted on social media, Curry takes a look at the box score before affectionately gazing at his teammate. Klay Thompson set an NBA record with 14 threes. The duo of Curry and Thompson is known as the "Splash Brothers" and what is either their bromance or sibling rivalry continues Wednesday against the New Orleans Pelicans.